After more than a century in the hands of the Mantilla family, one of Ecuador's oldest and most traditional newspapers – El Comercio – has been sold to Latin American media mogul Remigio Ángel González, a Mexican who launched his TV empire in Guatemala and is known for avoiding editorial conflict with governments. The sale marks a turning point for Ecuador, where El Comercio was considered one of the last bastions of opposition in a media landscape that increasingly favors President Rafael Correa's administration. The government has long been at odds with private news organizations while simultaneously expanding its own state media network. In Venezuela, another country where the government has been in confrontation with private media, the leading newspaper El Universal was also sold last year. A couple of months after the sale to an unknown group of Spanish investors, El Universal changed its editorial line and fired columnists who had been critical of the government. While the legality of El Comercio's transaction remains dubious, long-time Ecuadorean journalists believe that the sale will have the effect of further limiting freedom of expression in the country, where the government has tightened its grip in recent years. While a sale had been rumored since mid-2014, the news was first broken by Organizaciones Muñoz-Ugarte on December 29. On January 15, El Comercio ran a short front-page announcement stating that as of January 12, 94 percent of El Comercio's shares – amounting to some 15.5 million dollars – had been sold to Telglovisión, S.A.
Telglovisión has a mere 800 dollars in issued share capital. The remaining shares, according to Plan V, are divided between two closely-linked parent companies, the Uruguayan Blackster, S.A. and the company that owns Guayaquil network RTS. The Blackster, S.A. representative in Ecuador is the president of RTS. While Telglovisión is registered in Quito, the president is Argentinian Josefina Tejeda Rodriguez. But the man behind the curtain, and at the head of the company that owns RTS, is Mexican millionaire Remigio Ángel González. Married to Guatemalan Alba Elvira Lorenzana and currently living in Miami, 70-year-old González has earned nickname “the Ghost” (El Fantasma) due to his discretion in negotiations that involve his holdings. Long a specialist in entertainment television and radio, González first entered Ecuador 30 years ago, when he purchased Tele4 Guayaquil. In 2010, the Miami-based company Albavision – named after his wife – had reportedly grown to control 26 television channels, 82 radio stations, and 40 movie theaters in 10 Latin American countries. Today, González owns an estimated 40 television channels across twelve Latin American countries. In Ecuador, he owns a combined 13 television channels and radio stations. The purchase of El Comercio marks his first venture into print journalism. The terms of the sale were not only murky but, in the eyes of many, served a government interest in silencing one of the few critical voices in a country increasingly dominated by government-allied outlets. For many, the sale flies in the face of the justification used by the government to introduce the 2013 Communication Law, which categorized media as a “public service” subject to government regulation. The administration announced that it would use the law to break up large media corporations. 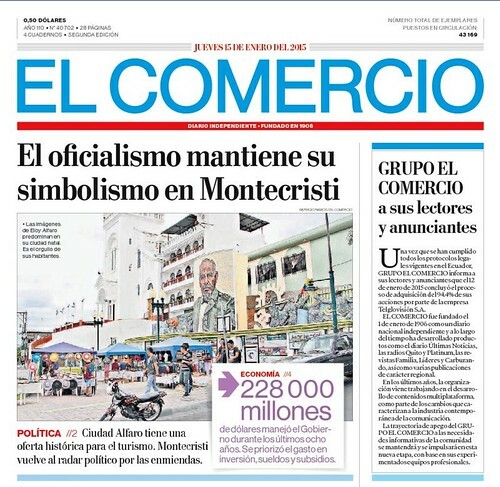 El Comercio, which was relatively small in size – selling for $40 million – has now been sold to a foreigner that continues to acquire an increasing share of Ecuadorean media space. The Communication Law states in Article 6 that: communication outlets of national character cannot belong, wholly or in part, directly or indirectly, to a foreign organization or company housed outside of the State of Ecuador, or to a foreign citizen. But in December of 2013, Correa passed a “reglamento,” a tool used to facilitate the implementation of the law. In this case, it acted to modify the original law – Article 6 – allowing foreigners from countries that had signed cooperative agreements with Ecuador to own national media outlets. In recent years, the internet has become a refuge for writers who are critical of the Correa government, but even that may be changing soon. This past weekend, the administration announced a strategy for fighting what Correa considers a “systematic attack” and “campaign of infamy” on social networks that intend to destabilize his government.